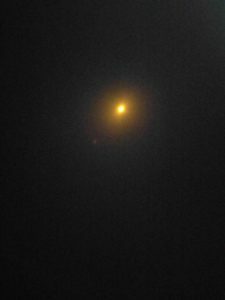 The daystar remained terribly unphotogenic while being eaten–it more or less looked normal on camera the whole time. We got to about 96% of totality, and it was amazing through eclipse glasses and terribly boring on camera. Even when I took its picture through my eclipse glasses. 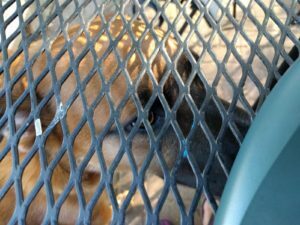 The dog was unperturbed by it all. 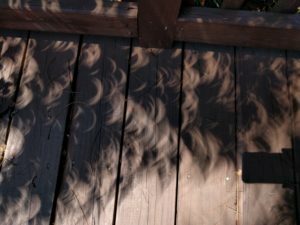 The shadows were pretty amazing though. 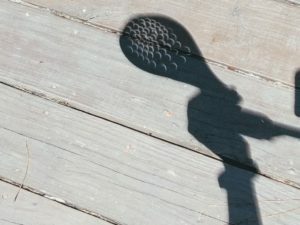 The strangest thing to me was the quality of the light. 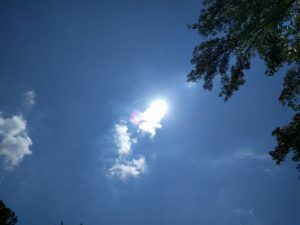 It looked wrong coming from overhead but being so dim–perhaps how the peak of noon at summer would be from a more distant planet, or one orbiting an older star. I enjoyed it. It’s here! Strangehold is now available for purchase here as an ebook or in print. Whew! I am both excited and nervous for other people to read it. I cut my urban fantasy teeth on Emma Bull and Mercedes Lackey, among others, back in the eighties and nineties. I have always loved the interaction between humanity and Faerie, the contrast of the contemporary world with the fantasy one, mortal humans and the immortal–or nearly so–fae. I’ve also always loved stories that cross worlds, so I wrote in several of them. Coming in August is a prequel novelette for newsletter subscribers, that sees Morgan and a fellow student travel to 1990s Edinburgh to participate in the Beltane festivities. Shortly after that, book two of the Crossroads of Worlds, Sorrow’s Son, will be released. Whew! A few weeks back I ordered a Neo Alphasmart based solely on reading Ann Aguirre’s twitter about a month back when she was talking about it. She praised her Alphasmart for a few things: its non-connectivity, its battery life, and its single function. I’ve now been using it for about two weeks. Reader, I’m about to praise it for much the same things. Design-wise, it looks a bit like a giant calculator and a typewriter had a baby. It’s smaller than a laptop and very light. I’m a big fan of its portability. It’s just so easy to take it into the backyard, or to the couch at night. It doesn’t get hot so I can hold it on my lap if there’s no convenient table nearby. Another downside–if you want to count the minimal text as a downside–is that the keyboard is a little different from my laptop keyboard. My fingers haven’t quite adjusted to the difference, and I make many more typos. Also, I usually compose in Word, which corrects a lot of common typos. I really had no idea how many “teh”s and “adn”s I type on the regular, since generally they get fixed as I go. On the Alphasmart, they remain, taunting me. But on the whole, it’s light and has an incredible battery life (on, I believe, a pair of AAs), doesn’t light my legs on fire if I want to balance it there, and perhaps most importantly, all you can really do on it is type. I do sometimes have a problem with checking twitter, or following links and then obsessively closing out my tabs during what is supposed to be writing time. This eliminates that distraction. And then when you’re done, you plug it into your computer and watch the letters scroll across the screen, magically typing themselves. It’s great. All in all, I’m quite happy with my purchase. I’m writing a short story on it right now, and it’s great to be able to take it outside. 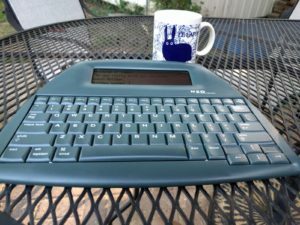 (I haven’t taken it to a coffeeshop yet, but I’m going to, as well as take it on some road trips later in the summer and maybe get some writing done in the car.) The Neo Alphasmart is n longer being made, but there seem to be plenty available on eBay and Amazon. If you ever have an issue with computer-related distraction or just want a portable, non-heating option for writing on the go, I’d recommend it. There are four paperback advance reader copies to give away, if paper books float your boat. 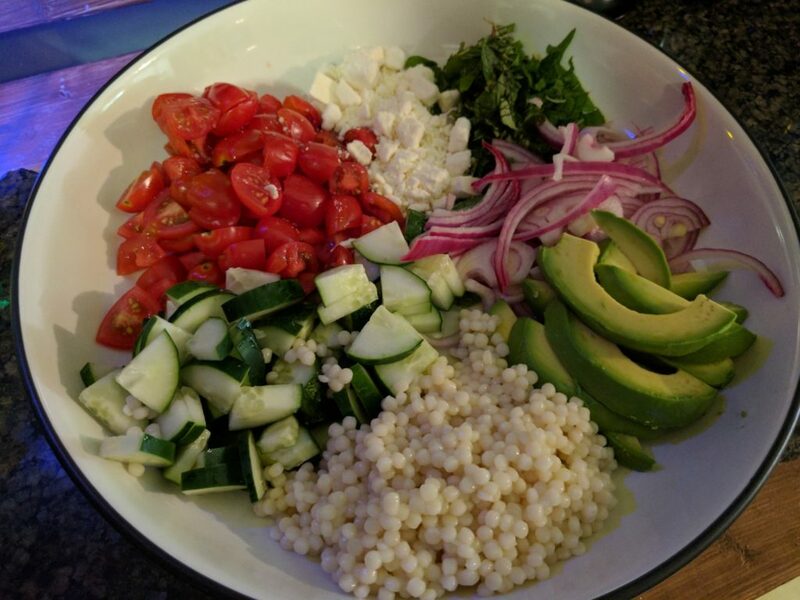 Pictured above is the Greek Goddess bowl, right before I stirred it up and made it look less pretty. No cooking involved, just chopping. This was delicious and fresh, with a lemon dressing and mint and oregano picked from the back yard. Definitely going to make it again. Asparagus soup. I have made this several times. It’s so good. Mediterranean Bean Salad. Lemon dressing on black beans and chickpeas on a bed of cucumber spirals. Delicious. Herby Cucumber Salad– Yogurt and dill cucumber salad. We leave out the mustard. Parsnip noodles with sausage and Brussels sprouts. 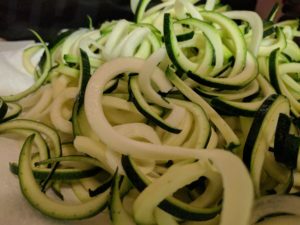 This was so delicious as is, but a little dry, so the second time I made it, I used half parsnip and half zucchini noodles, and added halved grape tomatoes and a splash of apple cider vinegar. Zucchini noodles with tomatoes and pesto. Simple and good. Sweet potato and Brussels sprouts. 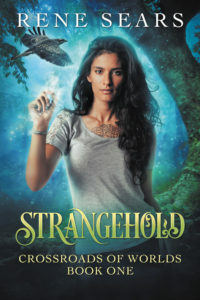 After a line edit, which caught an amazing number of typos, I’m happy to be able to say that my urban fantasy novella Strangehold is live for preorders! Also, there’s a Goodreads page here. It’s all starting to feel very real. Morgan Tenpenny has retreated from her painful, magical past, choosing to live quietly as a guardian of one of the gates between worlds. But her sister Gwen is married to a lord of the High Court of Faerie—and when Gwen asks her to protect her nieces, it’s time for Morgan to emerge from her seclusion. The gates to Faerie have inexplicably closed, and no one knows why, not even Falcon, the fae Morgan finds trapped on her side of the gate. As a devastating illness that only affects magic users starts to sweep through the country, Falcon tells Morgan of a way to reach her nieces in Faerie through a mysterious place called Strangehold—if Morgan can trust that Falcon is all that he seems. But with the Queen of Faerie increasingly defensive of her borders, even their combined powers may not be enough to win them through. With relations between fae and human falling apart and a deadly illness threatening all of her old colleagues, Morgan finds that her past isn’t as dead as she’d thought. She must navigate the threats in time to save her nieces—and just maybe the world. I am not, by nature, a terribly organized person. But I’ve had to become one out of self-defense. Between family and work and day-to-day minutia, writing time will get eaten if you let it. 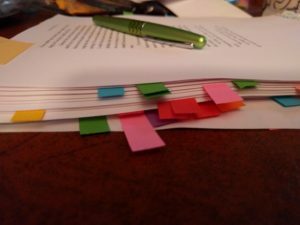 Back in January, I looked back at 2016 and I could see that I hadn’t accomplished all I really wanted to writing-wise. Thinking about it, I decided that I needed more concrete actions to try to reach my goals. The Antoine de Saint-Exupery quote above really resonated with me, so one of my goals for 2017 was to start setting more deadlines for myself, because without them, time can slip away. I started erratically keeping a bullet journal last year. I’ll be honest, the BuJo syst em didn’t 100% work for me, so I made some adjustments to it and am now using my notebook more like a traditional day planner with a few extras. what I want to accomplish that month. 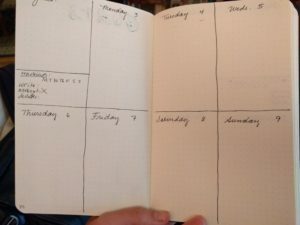 I’ve experimented with different formats for the weekly pages, and finally found one I like. 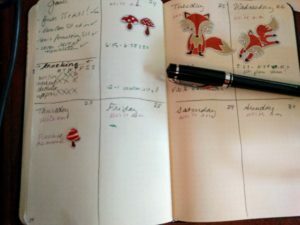 There’s a space at the beginning to note weekly goals and a place to track a couple of things. schedule writing time on my daily calendar, particularly in the morning right when I wake up and before my kids do. If I get in even a brief writing session in the morning, it seems to make it easier to fit more in later in the day. I keep my planner next to my laptop so when I sit down I see “Write” written in below the day of the week and it reminds me to prioritize it. As a subset of the above, I shut down my browser at night and leave whatever document I’m working on open so it’s the first thing i see when I go to the computer. log my writing time and give myself a sticker if I hit my daily goal. I tried having a separate grid for the whole month to fill in with stickers, but it seems to work better for me if I fill in on the weekly calendar as I go. 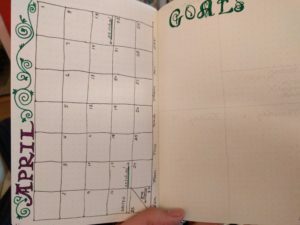 At the end of the weekly pages, I have a page to track what I’ve read, and then opposite that, a page where I assess if I met my goals for myself, and why I didn’t if I didn’t. So here’s this week’s layout, with stickers and notes. I do think this year I am accomplishing more of what I want to, because I’ve set timelines instead of hoping to get X amount of things done this year. It’s also helped in that I can look back and see how I spent my time, instead of getting to the end of the month and either having met my wordcount/editing goal/whatever or not, but not having documentation of how I got there. (Or didn’t!) A big part of staying on track for me is finding the balance between not beating myself up if things get too busy that I don’t meet my goal, but also not letting procrastination set in. My process is constantly evolving, but this is working for me right now. I’d love to hear what works for you. This story came about as a result of mishearing a speaker in a documentary about cooking through history. I don’t recall what he actually said, but what I heard was “defensive cookbook.” That immediately sparked ideas about resisting a siege through cookery, but as I sat down to write it, I realized that the kind of resistance one might achieve through cooking would most likely happen after the siege was over. I hope you enjoy! So this was my first year to have a raised bed garden. Some backstory: I worked for years as a florist. I took cut flowers and arranged them into pleasing shapes. I have always been unfortunately adept at killing houseplants, so I liked to think of myself as a plant mortician–not much good at keeping them alive, but I can make them look nice once they’re dead. 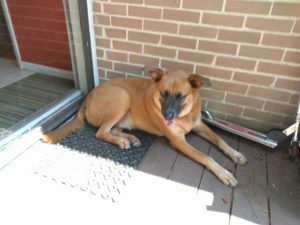 My sister-in-law, who lived across the street until just recently, on the other hand, had four raised beds and had more tomatoes, cucumbers and peppers than she knew what to do with. We received some of the overflow, and when they moved this spring, they offered us one of the raised beds. We’ll take it, we said, but I admit I was doubtful at my ability to keep the plants alive. Start your seeds earlier. Read the packets and note how long it takes stuff to grow to harvest. You’ll want that information later. When the packet says to thin the carrots to two inches apart, do it. Your carrots came out all weird and stumpy this year in part because you didn’t and they were pressed up against each other. Next year, plant with an eye toward the sun. The cucumbers and tomatoes grew so fast, they shaded the poor peppers into stuntedness. Moving the pepper to a pot was a success (now we have bell peppers!) but next year, put the fast growers in the middle and the peppers toward the edge. Garden bugs are a nuisance and squash bugs are the very devil. They killed your cucumbers, and you blame them for the butternut squash, too. Next year, squish to kill as soon as you see them. You know what they look like now. And maybe plant the curcurbits with some distance between them to make it harder for the little bastards. It’s okay for you and the child who eats vegetables to mourn the cucumber plant. He grew it from a seed, after all, and learned that he could eat a whole cucumber. You were both sad when you pulled up the desiccated remains (damn you, squash bugs), but he was the one who cried. Maybe more marigolds between the plants next year? There is no flavor like the flavor of a cucumber you just picked. 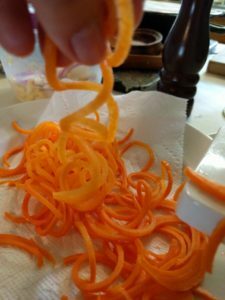 You sliced one for the first time and the whole kitchen smelled like summer. Next year: plant less basil. This sounds like heresy, but hear me out. You could make a mountain of pesto right now and still have basil left over. Plant more dill. You never had enough for cucumber and tomato salad. The cantaloupe didn’t produce many melons, and they weren’t very big, but the boys adored them. A++, do plant again. The summer crop is coming to an end, and you’re already eyeing lettuces and radishes and more carrots (thin them this time!) Let’s do it. We’re going to need another bed.